Vintage glamour is back. While for years, that meant Hollywood glamour and mid-century modern style, today's new vintage is all about the 1970s. The retro style has returned. From oversized macrame wall hangings to the red-wine color palette of Marsala, we're being a bit nostalgic in our homes today. Nothing has produced a greater nod to that bygone era, than the return of the swivel chair. No longer an old-school piece that your parents may have had, the swivel chair has become a beautiful statement piece, in bright, bold shades, wood or metallic finishes, and of course, that fun swivel. From Jonathan Adler's Mrs. Godfrey Swivel Chair above to 1st Dibs collection of Adrian Pearsall chairs, here are a few of our favorite side chairs that swivel in the most glamorous way. This bold pair is a new release by George Coldren for Chairloom. The chairs have been outfitted in stunning black and white fabric on the back, and we can't get enough of the chrome bottom. It feels like a modern ode to 1970s style, and we absolutely love it. This red pair has a feel of modern drama. From 1st Dibs, this vintage seating, blending a rusty red fabric, with a walnut base is by designer, Adrian Pearsall. While the era may be a little more 1960s than 1970s, vintage pieces like these are an authentic way to bring some swivel style home. Room & Board is one of our favorite places for modern seating. With an array of finishes available, you can customize their Otis Swivel chair, in some pretty beautiful shades. We're big fans of Vance Blossom in velvet fabric. It gives this swivel chair a bright and unexpected pop. Beyond the swivel chair, swivel sofas are also making their way back into interiors. The ultimate statement in luxury, this crisp, white sofa from Amoenus is a stunning piece. Finished with a chrome base, it's the very definition of moveable modern luxury. When looking for swivel chairs for a modern space, we recommend going with something very tailored, like this berry Floradora Swivel Chair from Amy Somerville. The look is impeccable and stuns in a bold shade. The finishing touch―a shimmering brass base, that will absolutely shine in your interior. These peacock blue chairs from Talisman have a unique shape to them. They feel unique, artistic and luxurious all at the same time, the definition of glamour. These are gorgeous pieces that are sure to be the center of any room's style upgrade. Jonathan Adler is taking us back to the days of Halston and Studio54 with this cozy, velvet swivel chair. It's the perfect accent piece for any interior. This pair of Milo Baughman chairs sport stunning brass bases. It's finishes like this that make the swivel chair a true head-turner. This chair by West Elm blends 1970s style with a bit of Hollywood glamour. We love the tufted details of this side chair. You can choose from a variety of shades to make this chair your own, but we absolutely love it in gray for a clean, classic look. If you want your room to have as much comfort as luxury, go deep with Louise Bradley's tub chair. The chrome stud detail along the arms and back truly makes this luxurious side chair stand out. Beyond your typical rounded shape, look for swivel chairs with new and unique silhouettes. This piece from Mitchell Gold + Bob Williams shows just how hip it is to be square. With a more solid shape to it, this chair exudes masculine style. 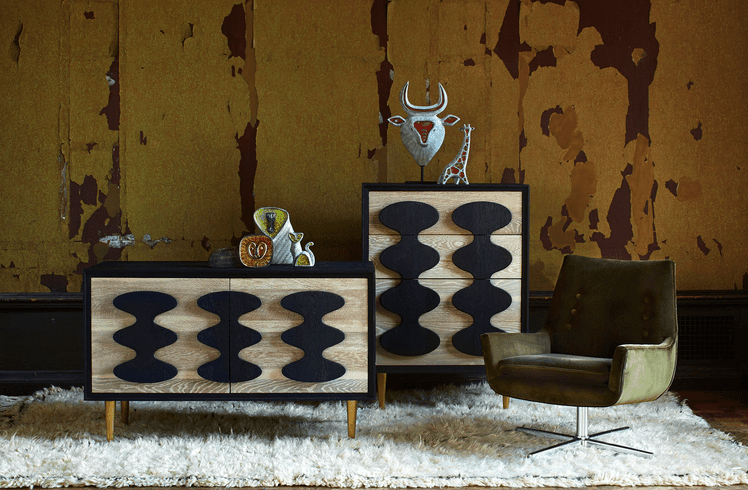 It's absolutely chic in a dark velvet or leather finish.